A bucket heater is necessary during winter to heat water to keep the temperature at drinking level for livestock. 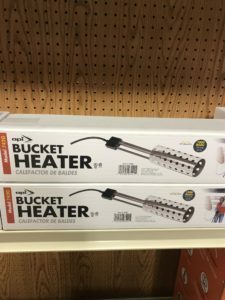 Stop by Argyle Feed Store this month and keep your livestock hydrated by using this heater. It’s well known that most horses will not drink ice cold water. This tool is designed to heat water as opposed to de-icing water. It will heat the water to over 180 degrees F.
A stainless steel guard protects the durable heating element. It comes with a 6-foot cord and is designed to rest easily inside a 5-gallon bucket. The heater is thermostatically controlled with over-temperature protection. For use in water only.Will not damage plastic containers. LOCKNDRY compatible. 1000 Watts, 120 Volts, 60 Hz. UL Listed. CSA Listed. One year warranty. This entry was posted on Thursday, December 21st, 2017 at 2:18 am	and is filed under News & Updates. You can follow any responses to this entry through the RSS 2.0 feed. Both comments and pings are currently closed.